Rob Tillett has been an astrologer for more than three decades. In previous incarnations a poet, musician, magician, healer, dramatist & composer, he is the editor and publisher of Astrology on the Web and has written many articles on this website. Astrology is one of the great adventures of human civilization and has contributed greatly to people's lives and to our culture over time. Astrology's purpose is to use the positions of the planets and stars in the sky to gather information on the individual and on humanity. 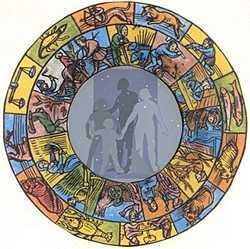 Astrology is a system that enables us to understand the past, present and the future within a universe full of meaning. Astrology literally means "the Science of the Stars", from the Greek astrologia: astron (constellation; star) and logia (study of; ordering principle; utterance). It contains both the idea of an organised body of knowledge of the cosmos, along with the way the stars "speak" to us, or give meaning to our lives [see Is Astrology Scientific]. A person who practices astrology is called an astrologer. A very ancient, but still vital discipline, astrology seeks the meaning and application of the influences of the planets, stars and other celestial phenomena in our lives. Astrology and astronomy have in modern times become separate studies, though for most of human history they were two sides of the same coin [see How does Astrology differ from Astronomy]. Exploring ourselves, our relationships and our place within the world, astrology has found that the symbolic relationships between the heavenly bodies are significant, and can be seen as a map to human destiny. This is expressed in the hermetic maxim: As Above, So Below. Astrology can give us insight into all manner of situations, from the personal to the political and from the most intimate to the most mundane. Because astrologers generally take a holistic view of the world, we can see that there is a spiritual connection between all things, even the planets, stars and us. To find the actual cosmic influences on events, character, and relationships, an astrologer must first draw up a chart, or horoscope [and thanks to the latest tech, you can now click here to calculate your own birth chart, free!]. Filled with arcane symbols, this symbolic map of the heavens is like a snapshot of the cosmic influences at work on that specific place at that particular moment in time. These influences will be expressed in whatever person or event is being born right there and then. The astrologer's job is to interpret the meaning of the symbols in the chart and to place these influences in an appropriate context, with relation to its subject. An individual horoscope, or birth chart, is a personal map; it tracks, in the case of your own natal chart, the planetary influences affecting your exact birthplace, at the very moment you took your first breath. Drawn in a map as unique as your fingerprints, these influences find expression in the course you take throughout the whole of your life. The symbols in your horoscope express deep meanings in a sort of cosmic shorthand. Astrologers use these symbols as a key to the understanding of your character, personality and relationships—and future. A horoscope can be drawn up for the moment of birth of not just a person, but also a project, an event, a business, even a country. Experience shows that all the events, people and things on planet Earth can be mapped from beginning to end by the energies symbolised in astrology. A deep understanding of astrology is like opening a doorway into the meaning of life, an initiation into the secrets of the world. It's a beautiful thing!